Mushrooms are a bit of a taboo subject around here. Dan being staunchly Anti-Fungi and myself being Pro-Yummy Little Cap-Shaped Vehicles for Sauce and Salt. So I have to admit my vast knowledge of mushroom sauteing has gotten a bit rusty these past years. . . BUT I do know this . . . to quote the wise words of Mrs. Kerkovich : "Wine, Wine and more Wine" is key. So imagine my surprise when Betty had no mention of wine at all in her Sauteed Mushrooms recipe! It lead me to look into this further. . . Apparently everything I ever knew about sauteing mushrooms was probably based on working class Italians choosing to cook with the wine they drank. See the Italian way to cook mushrooms should be done with white wine. . . not red. I guess this would explain why all these years whenever I made mushrooms for people - they would comment on how they had never had mushrooms like that before and follow with compliments - that I am now convinced is some food version of the Emperor 's New Clothes. 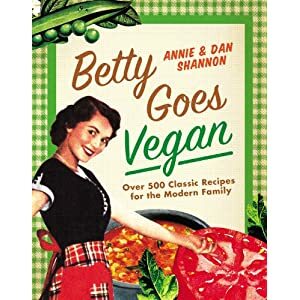 There was chatter on Facebook about how I should stay true to Betty and just use the margarine and others who pointed out that you can't drink margarine while you cook and what's fun about that? Leading me to face my own biased ideas about mushrooms and well - A GREAT MUSHROOM SHOWDOWN. Heat all the ingredients except the Mushrooms until the butter melts and then stir the Mushrooms. Cook for about 4-6 minutes. 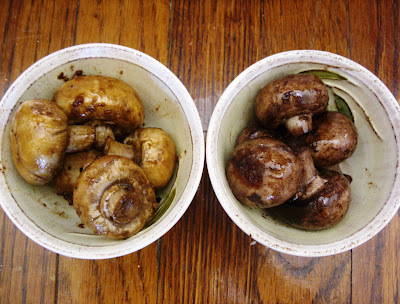 Heat the oil in a cast iron skillet on Medium heat - till it coats the bottom and throw in the Mushrooms and Wine. Once the Mushrooms begin to brown - well - they actually turn kinda purple - add the garlic. Stir the Mushrooms ever so often to keep them from cooking too much on one side. Eat them once they are soft and kinda spongy like. It went fast. . . 2 skillets on medium heat filling our kitchen with savory aromas . . . the whispering sizzle. . . and the result. . . A DRAW! They both rocked. They both would be good on a burger or in pasta and were different and unique enough to not really compete with each other. It all really depends on preference - Betty's was a little salty but that can be good too - just saying. I really dig mushrooms sautéed with wine...but from what inspiration did you start using red wine for that purpose? We've always always always used white in my family, and I just can't imagine red...maybe next to something really, really hearty, like a thick vegan burger with barbecue sauce. I just saw this comment sorry it took me so long to answer. We just just always cooked mushrooms in red wine at my house. It does make them pretty hearty - especially the big Portabella caps. They get almost down right beefy.